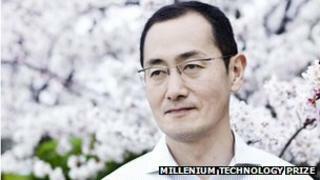 Japanese stem cell scientist Dr Shinya Yamanaka has been awarded the Millennium Technology Prize. His award is for discovering how to reprogram human cells to mimic embryonic stem cells, which can become any cell in the body. Called induced pluripotent stem (iPS) cells, these now aid research into regenerative medicine. He was joint-winner with Linus Torvalds , who created the open-source Linux operating system for computers. This is the first time the prize has been shared by two scientists - they will split the 1.2m euros ($1.3m; £800,000) award. My goals over the decade include to develop new drugs to treat intractable diseases by using iPS cell technology and to conduct clinical trials using it on a few patients with Parkinson's diseases, diabetes or blood diseases. The President of the Republic of Finland, Sauli Niinisto, presented the prize at the Finnish National Opera in Helsinki. Dr Ainomija Haarla, President of Technology Academy Finland - the foundation which awards the prize every two years - said: "The International Selection Committee has to judge whether an innovation has had a favourable impact on people's lives and assess its potential for further development to benefit humanity in the future. "The innovations of both this year's winners embody that principle. "Dr Shinya Yamanaka's discovery of a new method to develop pluripotent stem cells for medical research could help combat intractable disease." In 2007 Dr Yamanaka's team announced that, by using four genes, they had successfully reprogrammed human adult skin cells into the equivalent of human embryonic stem cells - which are potentially capable of becoming any other cell type including neurons, heart muscle cells and bone cells. This means stem cell research into currently incurable diseases and regenerative medicine is possible without the controversial use of human embryos. iPS cells also have the potential to help solve the problems associated with cell transplant rejection. Dr Shinya Yamanaka said: "My mission now is to advance iPS cell research in cooperation with many researchers around the world and bring the technology to medicine as soon as possible. "My goals over the decade include to develop new drugs to treat intractable diseases by using iPS cell technology and to conduct clinical trials using it on a few patients with Parkinson's diseases, diabetes or blood diseases."